← I trust you as a Doctor but now you’re a Businessman do you mind if I have an itemised receipt? 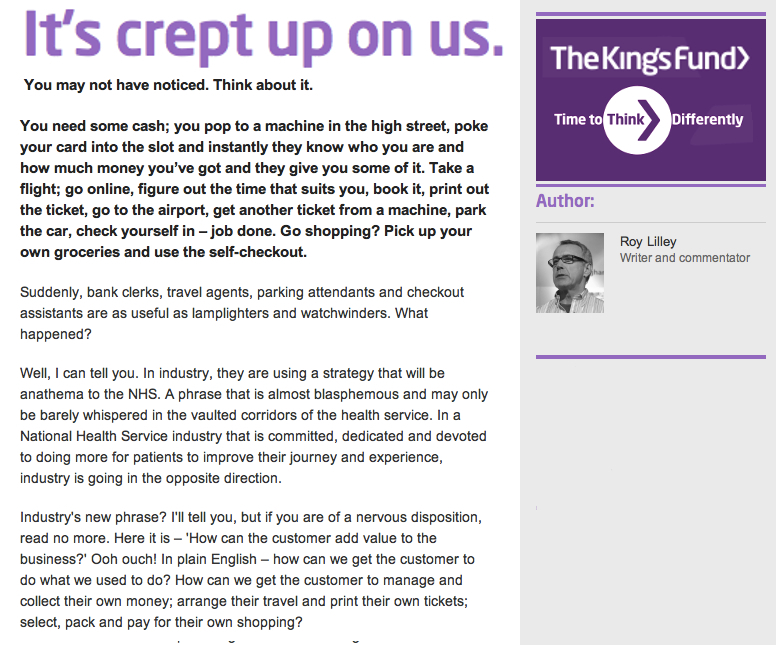 Roy Lilley, independent health policy analyst, writer, broadcaster and commentator on health and social issues, writes on the Kings Fund Blog. Related: Care providers being out innovated by the UK’s Telecom Regulator. Join us at the mHealth Symposium in Dublin (May 13-14) and help us educate the principle decision makers in the European Healthcare Industry on the enormous opportunity they have to leverage the consumer technologies that Patients and Carers take for granted in the real world. My Dad had a small stroke last year caused by AF. In the recovery phase he asked me the same thing “I take my BP and pulse every day and write it down – why can’t I do it and record it in a spreadsheet and Skype with my GP periodicaly?” He is doing well but still keeping his own records that aren’t shared. My Mum was recently put on new meds – she had a six month diabetic check (type 2 diabetes which she has lived with over 10 years and which is well controlled by food control). After moving house, a litter of puppies and major eye surgery, she had to cross a construction site to her new GP practice which took her BP once and decided without discussing that or her Cholesterol result with her to add two new meds without any consultation – she found out when her repeat prescriptions were delivered. She declined the unknown drugs and complained to the practice. She too is taking her BP now everyday to demonstrate to them that she has reasonable BP and controlled blood glucose. It really should not be this hard for people to be involved in informed decisions about their health should it? Thanks for your contribution hopefully you’ll get a chance to watch the videos. You’re absolutely right it shouldn’t be this hard but I think a lot of it stems from a basic failure of this £104Billion/year system to effectively document care. BTW have you seen the iPhone ECG case by Alivecor? 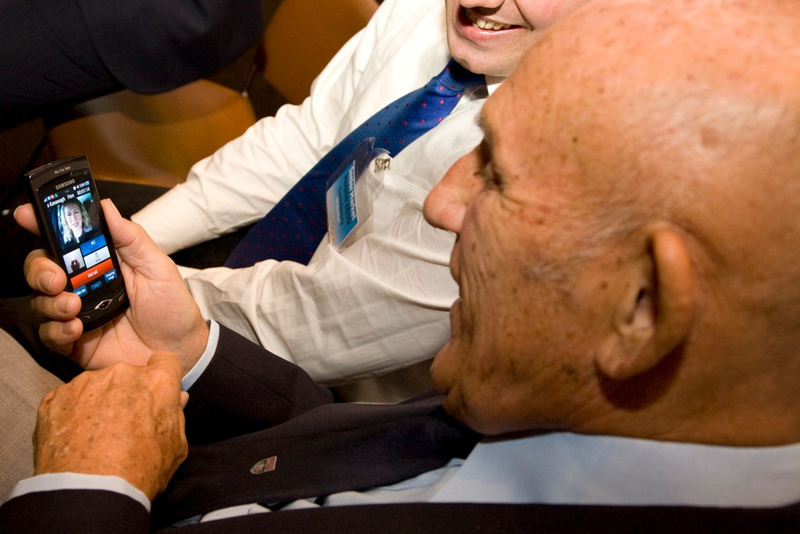 Read here about our early experiences with this tech as it sounds like it would be perfect for your father’s AF monitoring needs (no for spreadsheet etc just launch the app and hold the metal strips). As for your mother declining “unknown drugs” it amazes me how little supporting information patients get with new medications especially when it’s so easy to share a link to an online video (about the new drug, it’s use and the reasons for it being prescribed) and the alternative is (as you’ve found) all too often a Doctor failing to engage with a Patient. Unfortunately we’re just a small company that can’t afford to follow every idea we’d like to but do feel encouraged to share challenges and ideas like those you have with developers who have the capacity to give them a shot over in the mHealth networking group on Linkedin. Reblogged this on Mental Health Geek.